What's an Underemployed Gal to Do? Run For Office. Since the recession began, millions of women have found themselves underemployed, working in survival jobs for which they're overqualified. If you're in the process of making similar life changes, why not run for office? America needs more women in politics. "Governments with more women legislators are more productive," noted the World Economic Forum. "National parliaments with the largest numbers of women have the lowest levels of corruption," reported the World Bank. It's a shame more American women aren't thinking outside the box, by putting their names inside the ballot box. Men still dramatically outnumber women in the U.S. Senate, the House of Representatives, state legislatures, and city councils. The U.S. ranks a pathetic 71st out of 189 countries in the proportion of women in national legislatures. American women aren't even close to the magical 33% tipping point where we could begin to change the conversation. No wonder the big stimulus winner in 2009 was Wall Street. The Old Boy's Club decided that if we bailed out Wall Street, the problems on Main Street would take care of themselves. "Nonsense!" said my gal pals, but few politicians heard them. More women in politics -- that's change I can believe in. Ladies, it's time to stop eliminating ourselves from positions of power. Today I spoke with a woman who took the plunge, got elected, loves her new career, and is happy to share lessons learned. Anne Doyle was one of the first women in the U.S. to gain access to professional locker rooms as a sports reporter for CBS-TV in Detroit. Years later, she rose through the ranks of Ford Motor Company to become director of North America Communications. 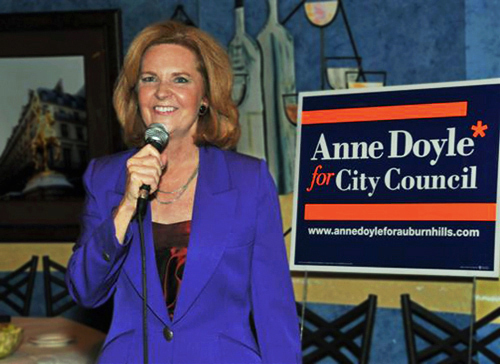 In 2009 she ran for a seat on the Auburn Hills City Council -- and won. Politicians live in a fishbowl. Weren't you afraid of becoming so visible a target? Anne Doyle: No, not at all, but I understand what you're saying. Fear is a huge barrier for women. I worked for three decades in sportscasting and the auto industry, places where people didn't always want me. I'm not afraid anymore. But don't you think a lot of women are too thin-skinned for politics? Women are better able than men to receive emotional messages. It's one of our strengths, but it also makes us more vulnerable. If we're going to put ourselves out there and become leaders, we simply have to accept that a certain number of people aren't going to like us. You grow thick skin like bark on a tree -- it takes time. The more you let the criticisms go, the better you get at it. Is fundraising another huge barrier for women? I had no problem raising money at all. In fact, and this is funny, I was so successful at raising money the other candidates started saying, "Hey, she's trying to buy the election!" Well then, you're the right person to ask for advice on soliciting campaign contributions. You start with people who believe in you. I wrote a personal letter outlining what I wanted to do, and asking for help. In response, several friends wrote sizable checks and it turbo-charged me. A California woman learned about me online and mailed a check. That was huge! We all have to write bigger checks for other women. It's in our best interest to get more women into politics. Why is 33% considered the tipping point? It's critical mass -- the point at which an environment changes in such a way, it can no longer go back to what it was. Take the Supreme Court, for example. One woman justice is newsworthy -- she's first. Two women are still the exception, not the rule. When you have three women on the bench, it stops being unusual. Whether you're talking about the halls of Congress or a board of directors, until women achieve 33% we're just tokens. Our numbers are too small to influence men to see things in a completely different way. It's not that women are better, it's that balance among the two genders is better. Across the board in a variety of professions, the number of women in leadership positions today is only 18%. We have a long way to go. That's why it's all about numbers now. How do we move the needle? We can move the needle the fastest by getting more women elected to political office, because that's where female leaders are the most visible. I was surprised to learn that women's progress into leadership positions has been stagnating for more than a decade. We made tremendous progress in the 70s and 80s, but in the 90s and 2000s the numbers got bigger only in the middle. Today we have more women doctors, more women lawyers, more women with graduate degrees, but we are stalled in terms of progress into leadership positions that shape the culture. How many women CEOs are there today? That number has barely changed in 20 years, even though there is a perception that it has. Let's say I want to throw my hat in the ring. What are the first three things I should do? First, start talking about it. I guarantee you'll be amazed at the encouragement you get. Next, become very clear about why you want to run. One way to do this is by developing your candidate website. It doesn't have to be fancy, but the process will force you to put into concise words who you are and what you stand for. Finally, make a list of people you can ask for campaign contributions, because you'll need money for postage, a Web site, and campaign materials. On the slim chance I raise more than $2 in campaign contributions, what's next? I highly recommend the White House Project training. It's a national, non-partisan initiative focused on dramatically increasing the number of women running for office. They've already trained over 9,000 women candidates, and hope to train well over 36,000 by 2013. I enrolled in their Debate Boot Camp, where I learned how to refine my message and present it to a large group. You took the risk and ran for office. What was the reward? Knocking on doors, I met the incredible people who are my neighbors. It created a powerful sense of community. That was the richest reward for me. You can't imagine how it feels, seeing your yard sign on the front lawn of people you've never met. I would jump out of my car and introduce myself. After the election, I was keenly aware these people were counting on me. How does being a politician compare to being a journalist or a corporate executive? Journalists are independent operators -- they develop and write a story, it's their own work -- and corporate executives make many decisions unilaterally. Political leaders, however, can't get much done by themselves. You have to collaborate. You have to influence people. Somebody called politics the art of the possible. It's about getting people to evolve together. Where's our common ground? Can women excel at this? The experience of running convinced me that women have a tremendous natural ability for politics. We just have to get over our fear of it and go for the brass ring. The good news is that there's been a dramatic change in attitude about women in leadership positions. I want to say to women, "C'mon, let's go!" Have you run for political office? Are you thinking about running in 2010? In 2012? What is the best advice you would give women thinking of running for a first time? Share your questions, concerns, and experiences with us and other women in the Comments thread below. UPDATE 11.14.2010: For the first time in three decades, the paltry number of women in Congress has shrunk.